Introduction: Systemic lupus erythematous (SLE) is among rheumatic diseases of unknown etiology. Fever of unknown origin (FUO) has been rarely reported to be the presenting sign of SLE. Presence of four or more SLE criteria is diagnostic for the disease. However, presentations may occur serially which make it much more difficult to diagnose an already questioned FUO. Case Presentation: Our case of SLE, presenting with a long history of unidentified FUO, was a 73-year-old man treated due to various diagnoses in different medical services before referring to the department of infectious diseases at Imam Khomeini Hospital. None of the previous treatments were effective to resolve his fever. In infectious ward, we performed multiple diagnostic tests to approach the FUO, and the patient serially presented some criteria of SLE. Therefore, we referred the patient to the rheumatology ward with late-onset systemic lupus erythematous (LO-SLE) for more work ups and management. Discussion: FUO in elderly has a wide range of differential diagnoses and Infection with tuberculosis, immunologic and pulmonary diseases, other multisystem diseases, tumors, and medications are presented on the top. SLE has rarely been mentioned after the age of 50 as a cause of FUO; but due to more severe damages to the body organs, its potential should be considered. Although our case presented only three criteria of SLE, this diagnosis was confirmed and treated by the rheumatologist; thus the symptoms and signs gradually improved. Fever is a prevalent symptom seen in different conditions, either infectious or noninfectious diseases, and usually resolves spontaneously or with medication; but fever of unknown origin (FUO) has been determined as a fever lasting for more than 3 weeks with a body temperature of more than 38.3°C in different occasions and absence of definite diagnosis after diverse hospital examinations (1). Some studies have identified that a distinct diagnosis of FUO could be made in 87% - 95% of cases. Although the major causes of FUO are infections including tuberculosis, salmonellosis, endocarditis, intra-abdominal abscess, viral infections, cholecystitis, sinusitis, otitis media, chronic pharyngitis, and dental abscess or malignancies, and systemic diseases such as systemic lupus erythematosus (SLE), rheumatic fever, polymyalgia, vasculitis, and Takayasu disease (Table 1) (2), the exact determination of fever etiology is not simple. Over 200 additional reasons, especially pulmonary embolism, hyperthyroidism, Crohn’s disease and Kawasaki’s syndrome have been found to be as FUO causes, which are divided to different categories, and few information is available to exclude the diagnosis (3). SLE is one of the challenging causes of FUO. This is among the rheumatologic diseases with unknown etiology. Although SLE is a rare disease in old people, 3% to 18% of people older than 50 are diagnosed with late-onset systemic lupus erythematous (LO-SLE) (4). Some researchers believe age as a modifier factor of the disease severity, clinical manifestation, treatment response and outcome (5, 6), and according to them, SLE is present in older patients with less common occurrence of severe symptoms compared to younger patients; for example serositis, pulmonary disease, and atypical manifestation of SLE as well as Sjogren's syndrome are more prevalent in elderly, while other manifestations such as malar rash, photosensitivity, nephropathy and arthritis are more common in younger patients. Furthermore, the laboratory findings in elderly are different from younger patients; in older patients, frequencies of rheumatoid factor and antinuclear antibody positivity are higher, but frequencies of anti-ribonucleoprotein (anti-RNP) and anti-Sm antibody positivity are lower compared to younger patients (4). These studies also believe lesser probability of major organs involvement in patients older than 50 (7). In contrast, there are some other studies showing the negative effect of age on SLE morbidity (6) and mortality (5); so the early diagnosis of LO-SLE has a great importance in the field of medicine. Tomic-Lucic et al. and Cartella et al. believed lesser organ damage during LO-SLE, but they also believed poorer prognosis of these patients. They mentioned that common causes of organ damage in patients older than 50 are the co-morbid conditions and higher risk of classic vascular involvement in addition to the SLE (8, 9). This is besides the lower tolerance of this population to the diagnostic work up approach to FUO (10). Presence of four or more SLE criteria is diagnostic (11); however, presentations may occur serially making it much more difficult to diagnose an already questionable FUO. aAbbreviation: FUO, fever of unknown origin. We described our case of SLE presented with a long history of unidentified FUO, also we reviewed the FUO causes notifying physicians to bear such diagnosis in mind in elderly to approach FUO. A 73-year-old man referred to the infectious disease clinic of Imam Khomeini Hospital in Tehran with a history of six months intermittent fever in the morning with oral temperature of 38.8°C and increasing frequency during the recent two months. He had visited a primary care physician because of a 2-month history of nonexertional chest pain worsening with inhalation 4 months ago treated with some pain killer medications, but it did not work. In his past medical history, he had a history of hospital admission with symptoms of fever especially in the morning with oral temperature of 39°C, chest pain worsening with breathing, and nonproductive coughs; he had received intravenous antibiotics after obtaining a chest X-ray (CXR) with the diagnosis of pneumonia for seven days, and then discharged with oral antibiotic therapy; but he did not respond to the treatment completely and his symptoms relapsed. This time, due to fever, chest pain, and history of non-pasteurized dairy consumption, suggestive of brucellosis, physician prescribed doxycycline and rifampin , despite Wright, Coombs Wright or 2ME tests were not performed. He was finally referred to the infectious diseases clinic of Imam Khomeini Hospital because these treatments were not effective. He had also a history of loss of appetite and weight and underwent coronary artery bypass grafting (CABG) 2 years ago because of myocardial infarction. The patient had no family history of diabetes, hypertension or cancer, but had a history of 20-pack-year cigarette smoking, but quitted for the past 35 years; also had negative results for addiction test. In addition to the mentioned therapeutic medications, he was taking prazosin for benign prostatic hyperplasia, and ASA and metoprolol for his cardiac problems. The patient was admitted in the infectious diseases ward of Imam Khomeini Hospital regarding his FUO. In physical examination (Ph/E), he was ill with a blood pressure of 110/80 mmHg, his pulse rate was 102 beats per minute and had a respiratory rate of 24 per minute; his oral temperature was 38.5°C in the morning; conjunctiva was pale, sclera was non icteric, there was neither cervical nor axillary adenopathy; dullness was detected in the percussion of the lower chest and in auscultation, the breathing sounds were reduced in the hemithorax. The abdomen was soft and non-tender, revealing no hepatomegaly or splenomegaly. The remainder of Ph/E was not remarkable. To approach FUO, we performed some laboratory tests summarized in Table 2. CXR had negative results for hilar adenopathy and other vasculature changes (Figure 1). 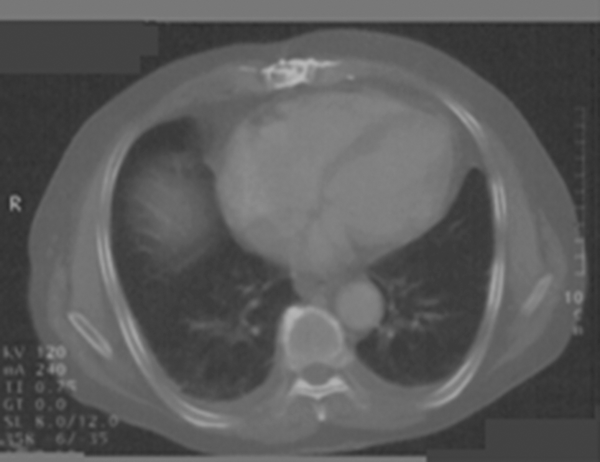 Computed tomography (CT) scan of the chest showed bilateral pleural effusion, dominant in the right side (Figure 2). An interventional radiologist aspirated the pleural effusion by ultrasound sonography guide which was semi-clear and yellow. The sputum smear for acid-fast bacilli (AFB) had negative results along with the purified protein derivate (PPD) skin test. aAbbreviations: 2ME, 2 mercaptoethanol; ACE, Angiotensin-converting enzyme; AFP, alpha-fetoprotein; ANA, antinuclear antibody; ANL, abnormal; B/C, blood culture; CA 19-90, cancer antigen 19-90; CEA, Carcinoembryonic antigen; CRP, C-reactive protein; dsDNA, double strand deoxyribonucleic acid; ESR, erythrocyte sedimentation rate; Glu, glucoses; INR, international normalized ratio; LDH, lactate dehydrogenase; Lymp, lymphocyte; MCH, mean corpuscular hemoglobin; MCHC, mean corpuscular hemoglobin concentration; MCV, mean corpuscular volume; Mono, monocyte; Neut, neutrophil; NL, normal; p-ANCA, Perinuclear; PBS, peripheral blood smear; Plt, platelet; Pro, protein; PT, prothrombin time; PTT, partial thromboplastin time; Qualit, quality; Quant, quantity; RBC, red blood cell; RF, Rheumatoid factor; TSH, thyroid-stimulating hormone; WBC, white blood cell. 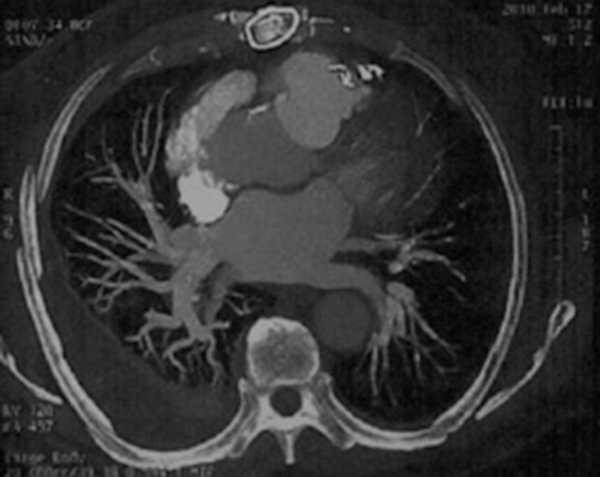 A pulmonologist suggested to perform a chest CT angiography (Figure 3). To assess the pleuritis caused by rheumatologic diseases, we performed other tests (Table 2). As the patient simultaneously revealed serosities (pleural effusion), immunologic disorder (anti dsDNA), and antinuclear antibodies (ANA and p-ANCA), SLE was more suspected, thus he was referred to rheumatology services for further work-up and management. We followed the patient after his admission in rheumatology service, and found that SLE diagnosis had been confirmed based on the three mentioned criteria. Prednisone 1 mg/kg daily and chloroquine 250 mg daily were prescribed for him. His fever resolved during a weak, and after 14 days we did not find any sign of pleural effusion in his control CXR. Other symptoms also alleviated gradually during two weeks. LO-SLE is a very rare cause of FUO in patients over 50 to 55 years; this is more complicated because of wide range of diseases with fever manifestation in elderly (10). Infection with tuberculosis (TB) at the top, immunologic and pulmonary diseases, other multisystem diseases, tumors, and medications are respectively the reported causes of FUO in elderly (6, 10). Although this case received many antibiotic therapies before referring to us, we excluded infections especially TB, viral infections, brucellosis, hepatitis, and parasites thoroughly from the differential diagnosis list. Inflammatory markers did not come up with an absolute diagnosis for the patient as they did not raise significantly, and their level of increase was not specific for a particular disease (11). Furthermore, mildly-increased white blood cells (WBC) count and platelet (Plt) count along with a diminished mean cell volume (MCV) were not diagnostic for any disease either. Among pleural effusion markers, proportion of effusion LDH/serum LDH was more than 0.6 which is indicative for exudative effusion; in this category of pleural effusion, only malignancy, bacterial infections and rheumatologic pleuritis could decrease the level of effusion glucose below 60 mg/dL. Sample cytology, the direct smear of bacteria and acid fast bacilli (AFB), and also the specimens culture all had negative results. 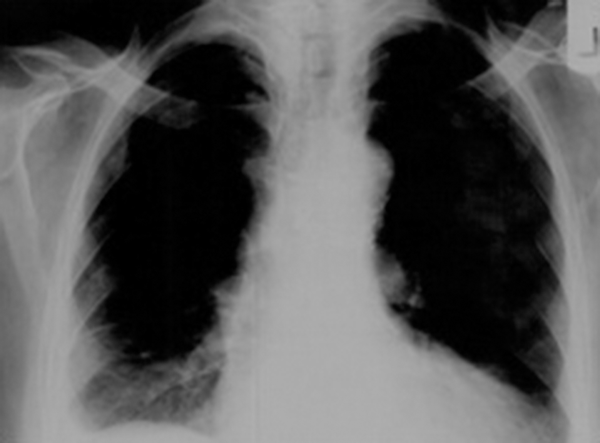 Pleurisy is among the most common pulmonary manifestations of SLE (11); this could occur along with effusions and could be difficult to be distinguished from malignancies or infections on imaging. CT scans of our patient only revealed the extensive pleural effusion (Figure 2), and did not add to the findings of CXR (Figure 1). aAbbreviations: ACR, American College of Rheumatology; Anti-Sm, Anti-Smith; SLE, systemic lupus erythematous. Our patient did not fulfill the criteria of SLE in his hospitalization period as he presented only three instead of at least four of eleven SLE criteria (11), i.e. serosities or evidences of effusion (pleural effusion), Immunologic disorder (anti dsDNA), and antinuclear antibodies (ANA and p-ANCA). It is recommended that patients with SLE should undergo treatment even with three criteria rather than minimum of four (11, 12); thus we referred the patient to the rheumatology services for more evaluation. SLE as a rheumatic disease mostly affects women at the age of reproduction. The diagnosis should be reached on the basis of the proposed criteria including clinical symptoms and signs as well as laboratory results (Table 3) (11-13). Our patient was the oldest ever reported, and showed a longer interval from the onset of symptoms to the LO-SLE diagnosis. This was longer than the reported intervals of 2 to 4 months, as in our patient it lasted 6 months until fulfilling three LO-SLE criteria. Beyan et al. reported two cases of LO-SLE aging 62 and 68 years (14). Our case showed that this is not an age-limited diagnosis, and might be a cause of FUO at higher ages, as he began to present the disease at the age of 73. In another report, Kallingal discussed a very unusual child presenting with epistaxis as a sign of SLE (15); their case was a sample of neglected SLE. In Petelin et al. study, they only found serositis (pericarditis) as a manifestation of LO-SLE along with FUO, and ruled out other causes of pericarditis. This study is similar to our case and in accordance with our findings (16). As mentioned earlier, varying manifestations of SLE should be held in mind, so the disease would not be missed. In conclusion, fever and more complicated FUOs should be considered as potential rare manifestations of LO-SLE. This is of more significance in the geriatric medicine where high levels of organ damage could occur. Our patient represented a very good sample of a rare incidence, i.e. FUO as a manifestation of LO-SLE, who was diagnosed based on ruling out infection and malignant diseases and according to his symptoms and laboratory findings. In addition, although our case did not fulfill the minimum criteria of SLE, according to the previous studies, he was treated with cortisone and chloroquine; so positive effects of the treatment were observed in the patient during the follow up period. No acknowledgements exist for any third party. Implication for health policy/practice/research/medical education: This study would be a very helpful notification for clinicians to bear in mind SLE when facing with FUO. Authors’ Contribution: All the authors contributed equally including in patients’ diagnosis and management, preparing the first draft and finalizing the work along with formatting the manuscript as a presentable version containing informative figures. Financial Disclosure: No financial issue is required to be declared. Funding/Support: No grant was obtained for this study.